Microsoft's Xbox One video game consoles can do more than just play video games. They can be used to watch broadcast television, view live streams, and play on-demand TV shows and movies. Here's how to watch TV on your Xbox One. Free-to-air broadcast television can be viewed directly on the Xbox One console without changing TV channels. This is done by a special Xbox One Digital TV Tuner accessory which connects to the back of the console and also plugs into your TV antenna. The ability to pause live broadcasts for up to 30 minutes. Play, pause, and change channels using Xbox or Cortana voice commands. Receive Xbox notifications and messages on screen while watching TV. Watch live TV while downloading an Xbox One video game in the background. To watch broadcast TV on an Xbox One, gamers in the United States and Canada will need to buy a third-party device such as the Hauppauge Digital TV Tuner for Xbox One while those in France, Germany, Italy, Spain, Australia, and the United Kingdom are able to use Microsoft's first-party Digital TV Tuner for Xbox One. Xbox One owners can watch TV shows and films on-demand by using a variety of apps. All of these apps need an active internet connection and work in much the same way as watching media via an app on your smartphone or tablet. Xbox consoles used to require an active Xbox Live Gold paid subscription for watching media in apps but this is no longer the case. Amazon Prime Video: Amazon's popular media streaming service. Crunchyroll: One of the biggest anime streaming apps. DC Universe: DC Comics' official app for Superman, Batman, and Wonder Woman TV shows and movies. Discovery GO: Discovery Channel's on-demand app. HBO Go: For watching HBO productions. Hulu Plus: A variety of classic and new TV series and films. Netflix: Easily the most-popular on-demand media service. Showtime Anytime: Showtime shows and films on-demand. Starz: The official Starz channel app. These are paid services, so you'll need an active account to watch TV or movies. In addition to watching TV series and movies on-demand, there are also several apps on Xbox One for watching live digital broadcasts of traditional TV channels in addition to online exclusive livestreams. Here are some examples of Xbox One apps that offer live broadcasts. Bravo: The official Bravo TV channel streaming app. HBO Go: On-demand and live streaming of HBO content. Mixer: Microsoft's video game streaming service. NBC: On-demand and live streaming of the NBC channel. Red Bull TV: Red Bull-branded documentaries and specials. Twitch: The most-popular video game and esports streaming app. WWE Network: The official app for wrestling fans. All of these apps are completely free to download on the Xbox One, however, some may require a paid subscription to a TV channel or service to access its on-demand media or livestream. One method of consuming media on the Xbox One that's often overlooked by consumers is its built-in Blu-ray drive that can play DVDs and Blu-rays. 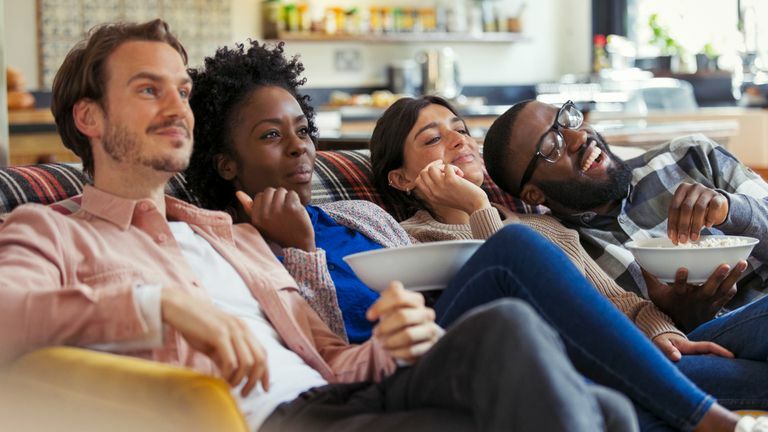 This can be a great option for households with a slow internet connection that prevents them from streaming media or for those who can't afford the monthly subscription fees for services like Netflix and DC Universe. You need to download the Blu-ray player app from Xbox One store. We'll show you how to get it up and running. The original Xbox One has a standard Blu-ray drive while the Xbox One S and Xbox One X console each have a 4K Blu-ray drive that can play 4K Blu-ray disks, regular Blu-rays, and DVD disks. The Xbox One S and Xbox One X are typically cheaper than a standalone 4K Blu-ray player which makes the purchase of either console a smart move for those thinking of buying a new video game console and a new Blu-ray player. They're a good two-in-one device.